I’m a huge fan of both Joker and Harley Quinn, since I also have a great love of pullips had been toying with the idea of Joker and Harley Quinn dolls for a while. 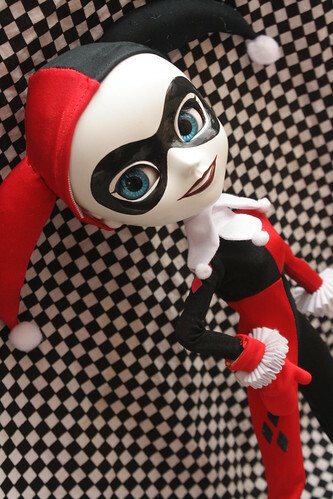 Last year for my birthday, I commissioned Requiemart to make me a Harley Quinn pullip. 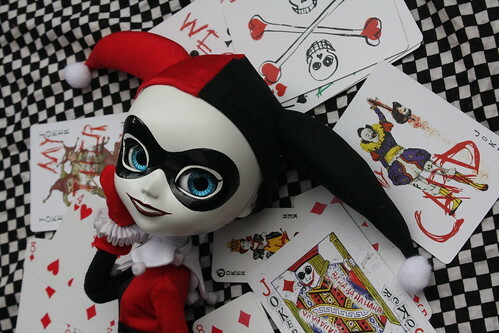 Harley Quinn is a custom Pullip Squall, she was previously customized before and had a lot of preexisting damage so it seemed the perfect way to give the doll new life. 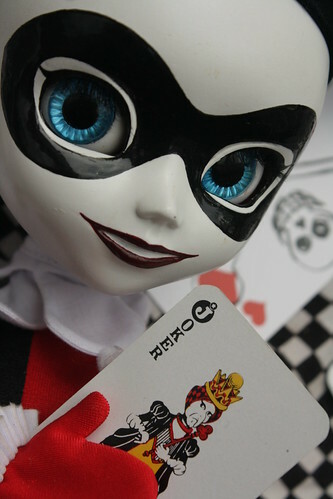 Harley Quinn is one of my favorite Pullips, she is an absolutely perfect representation of the character in Pullip form. It’s been brought up a few times, that if I loved her so much why don’t I take more pictures of her… I would photograph her more if I didn’t get a ton of offers for her every time I took her pictures. She is not for sale and she never will be, I dislike the amount of undue attention she seems to attract so I choose to only photograph her sparingly. It’s not a paint trick, Harley Quinn’s grin is actually carved into her faceplate. Carving can be a bit chancy as there are very few ways to fix it if it is screwed up, Requiemart did a fantastic job with her grin. The doll she was before had previously been carved as well, her eyebrows had actually been carved into the doll’s head which was kind of surprising/horrifying as that type of thing is not done Requiemart was able to fill in the area since she had to paint over it anyway. Eventually there will be a Joker taeyang or Namu as well, he’ll be a very complex custom with the amount of carving involved. On a much sooner timeline there will be a very stylistic interpretation of Duela Dent. This entry was posted in 2011- 365 Toy Project, Comics, Love that Joker and tagged custom, custom pullip, harley quinn, Pullip. Bookmark the permalink. I can see how you’d get a lot of offers, both Batman fans and doll fans would want her. If there’s an enthusiastic fan of both dolls and Batman, I’m sure you have at least a couple bothersome messages from them. LOVE LOVE Duela Dent! I can’t wait to see them side by side! What an awesome looking pair visually! Also I forget do you have a wig for Harley for poses where the hat is pulled back? In the animated series I think she was a blonde, but I could see the wig not looking nearly as nice as her hat. I get offers on dolls fairly often but I tend to get a lot of attitude along with the offers on Harley “I am a lot bigger Harley Quinn fan than you- she should be mine!” . I love my Harley Quinn but goddamn that attitude gets really old quick. I just got the official Harley Pullip NYC CC Edition and I found your page. 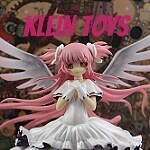 I really appreciate custom work and this is a really great job done on her. I like the bright eyes and smile on the one you got so I think she holds up to the test of time. The outfit is really well done also. The only things I like better on the offical actually is the material of the costume is shiny stretch velvet (I effing LOVE stretch velvet haha), the mask is now removable, and the official has blonde hair under which yours doesn’t seem to have. But who cares right, if you’re displaying her, chances are you’ll have the hood up anyway. Custom Harley has a wig for when she is not wearing her hat but the design choice was made to be more form fitting as it ended up looking really strange with a wig underneath when we tried it, besides she always wears her hood (I have other dolls as her civilian form and Arkham Asylum form).